Elyse Kats left the Midwest for the Arizona desert and hasn’t looked back. 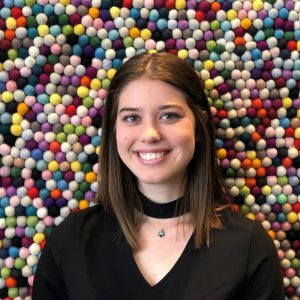 Kats, an Arizona State University School of Sustainability undergraduate student, is from Kansas but is happy she decided to move out of her comfort zone. And it’s good she did: Kats said she’s loving her college experiences, not only in her classes but also as a Doris Duke Conservation Scholar, a founding member of Green Greeks and a research aide for the Decision Center for a Desert City. On top of her bachelor’s degree, Kats is pursuing a minor in parks and recreation management and a certificate in socio-legal studies. “I hope that I can one day have a career that I can make a difference in my community with, and I know ASU is giving me the tools to do so,” Kats said. What was your “aha” moment when you realized you wanted to study sustainability? My "aha" moment when I knew I wanted to study sustainability was honestly right when I saw the School of Sustainability website. I found the major map, and it was so refreshing after reading through hundreds of civil or forestry engineering major maps at other universities I was considering. I love the transdisciplinary approach that the School of Sustainability gives me, and these aspects made ASU and the school an easy choice for me — not to mention the Phoenix weather. What’s been your favorite class so far and why? My favorite class so far within the School of Sustainability is either Sonja Klinsky's Equity, Justice and Sustainability course or Bryan Leonard's Economics of Sustainability course. These two courses have been the most intellectually stimulating for me in completely different ways. Klinsky's course engaged our critical thinking skills and allowed us to participate in a lot of unique ways; we even got to brainstorm ideas for the ASU sustainability goals that were focussed on ethics and justice. In Leonard's course I was challenged with math problems and economic theory I did not have background in, but Leonard did an amazing job of making the class relevant to sustainability, and I loved expanding my horizons through this course. Can you tell us more about being a Doris Duke Conservation Scholar and your involvement with Green Greeks? It has been an honor to be a part of the Doris Duke Conservation Scholars Program (DDCSP). This past summer I got to explore the Colorado Basin and learn about conservation and policy. 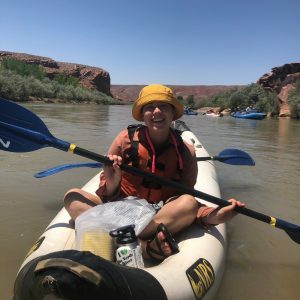 Some of my favorite highlights were our four-day river trip down the San Juan river in Utah, canyoneering in Arches National Park and visiting Bears Ears National Monument. We learned from Navajo and Hopi elders, professionals, government employees and more. I am looking forward to the second summer of the program this upcoming summer where I will have an internship. As for Green Greeks, I was excited to start this organization at ASU along with my fellow siz executive council members. We just hosted our first event, Hallowgreen, in the Greek Leadership Village, and over 800 individuals attended! We had tabling, tons of food, and pumpkin carving (all pumpkins were composted). In the spring, Green Greeks is going to begin our individual chapter projects, where I will coordinate with all 20 of our chapter representatives on what change they would like to see in their chapter, then I will help them find a way to make those changes happen. I have loved being a part of DDCSP and Green Greeks. Both organizations are focussed on helping sustainability reach populations that it typically doesn't, and I can't wait to see how they both turn out. How do you envision applying sustainability to your future career? I intend on staying at ASU to pursue a masters degree that will relate to my interests in urban recreation, sustainability and policy. I hope that I can one day have a career that I can make a difference in my community with, and I know ASU is giving me the tools to do so. I am currently a research aide at the Decision Center for a Desert City, where I am involved in research on urban and rural water issues around Arizona, and I hope this translates into more knowledge and opportunities within this field. Sustainability to me is an interdisciplinary approach to creating a better future. I personally have chosen to focus on policy and governance, especially in urban areas. I also over the past year or so have learned that sustainability to me includes inclusiveness. Sustainability isn't a topic only for the typical white wealthy man who likes to hike, sustainability is a topic that influences everyone. This is why I think programs like DDCSP are critical. It is imperative that we get diverse youth and young adults more engaged in sustainability and future careers in the field so that we can move forward with progressive goals.